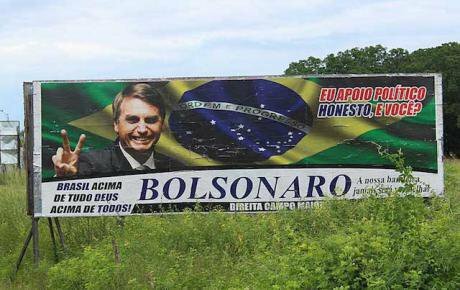 Billboard for Bolsonaro's presidential campaign. Almanaque Lusofonista & Creative Commons Attribution. The election of the extreme-right candidate Bolsonaro to the presidency of Brazil consolidates the wave of right-wing governments that have been recently dominating the election cycle throughout the region: Argentina, Chile, Paraguay, Peru, Colombia, Guatemala, Honduras..They all opted for a right-wing political drift, away from the "pink tide" of the 2000's. The immediate resemblance of Bolsonaro to Trump, or the explicit threat to the Amazon rainforest and social activism, show what the upcoming government may be capable of, a government that is so extreme-right that is occupies a space reserved for authoritarian tendencies. Only Mexico, with its anti-cyclical tendencies, Ecuador and Costa Rica, have managed to buck the trend, and the traditional left in Venezuela and Nicaragua have also adopted repressive and authoritarian traits (Bolivia is a particular case). The analysis regarding the reasons for this ultra-conservative populist turn in Brazil and the world has been saturating the media as of late. There is not one sole reason, nor have all phenomena of this type manifested themselves in the same way. However we can determine at least 5 insecurities that led Brazilians to vote for this strong-man-iron-fist figure in the second round of elections last week. The deep crash of the Brazilian economy in 2015/2016 hit the population hard. A country used to strong economic growth suddenly found itself in a state of decline by 7.4%, producing a huge sense of economic insecurity among the population. The rich saw their internal market and their fiscal privileges threatened without receiving compensation in return, in the context of the growing public deficit. The middle classes, especially the millions of Brazilians who have been lifted out of poverty recently, fear for their savings and their jobs, and in too many cases they are right to do so. The poor, finally, saw how the arrival of conservative president Temer and a strong drop in state funding cut significantly their minimum borrowing capacity. The Workers Party, that in their last years in government betrayed many of their supporters by introducing austerity policies, could not build strong alliances, and after being accused of corruption and thievery, were portrayed as the great enemy. With a tough discourse, an entrepreneurial edge, and a desire to lift Brazil out of the economic rubble, Bolsonaro connected with the electorate. “Brazil above everything, and God above everyone” was his electoral catchphrase. Putting “honesty”, individual morality and the virtues of the market/privatisation first, he was able to take advantage of economic uncertainty and rise to victory. A hard hand against violence is one of the most divisive principles of Bolsonaro. The formula consists of increasing militarisation in a country where military presence on the streets is already common, decreasing the age of penal responsibility that threatens to fill prisons with young people, and freeing access to firearms, that will surely cause an increase in the already unbearable number of homicide victims. Public insecurity has no magical solution, but the combination of self-defence and militarism, although irresponsible, has proved extremely popular. The gesture of shooting with both hands has become a symbol of identity of the ‘Bolsominos’. With more than 60000 murders per year and a prison population of more than 725,000, the third largest in the world, fear and violence and the promise to put an end to banditry struck a chord with Brazilian voters. The smearing of the political classes which has been observed throughout the region, has an added element in Brazil that has facilitated this process: corruption, that in fact, is a cross-party phenomenon. The clean-up operation conducted by judges ended up with Lula da Silva, the most popular candidate, in prison, and the political pursuit of the right to supress the Brazilian left culminated in the impeachment of Dilma Roussef in 2016. The strong anti-corruption sentiment opened the door for an outsider that although he had been in the very Brazilian congress for 28 years prior to the elections working alongside those who he suddenly called corrupt, presented himself as entirely clean. The destruction of the Workers Party accused of being communist and pro-Venezuela, together alongside the millions of those who felt disenchantment with the achievements of Lula’s government, has proved yet again successful. The enormous lack of prestige of all political parties, and the insecurity regarding the trustworthiness of the political class identified as ‘the elites’ or ‘the establishment’, highlights the urgency of a change in the system. This is ideal ground for a Bolsonaro type to appear as the ‘saviour to the problems of the people’ with a miraculous and simple formula. Much the same as the famous US comedy the Blues Brothers, Bolsonaro is here to complete a “mission from God”. To these three insecurities two more can be added: identity insecurity, that has seen a battle between civil rights and diversity up against traditional family values and the Bible, and informational insecurity, that has seen attacks on conventional media outlets, writing them off as liars and manipulators. This opened up space for the circulation en masse of fake news, where truth no longer exists and post-truth triumphs. What matters is what one believes, even if it’s only what you’ve read on WhatsApp and it’s already known that people are sharing lies. These are the 5 insecurities that could help explain why Jair Messias Bolsonaro has triumphed so significantly in Brazil. His extreme positions will no doubt plunge the country into a state of total insecurity, and the only question is, how long will it take?